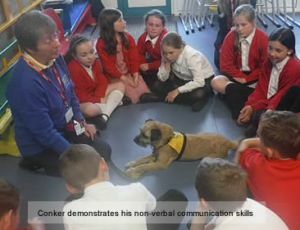 Firstly, Pets As Therapy dog Conker went into school to demonstrate his non-verbal communication skills. Companion animals can bring sunshine to people at all stages of life. They evoke our feelings and memories, and forge meaningful connections between us. Two inspirational videos illustrated that people living with dementia and children share the same difficulties. ‘We have problems tying shoelaces; we put our clothes on back-to-front; we forget birthdays, we can't add up'. We can get by, though, with a little help from our friends, including our animals. The second event was held in Husthwaite Village Hall. The committee is proud to announce that HVH is now a member of the Hambleton Dementia Action Alliance. Committee members have all become "Dementia Friends", with the ambition to make Husthwaite a "Dementia Friendly Community". 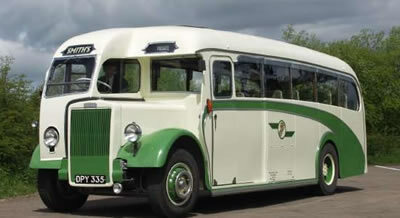 Twenty five schoolchildren walked through the village to Primetime. 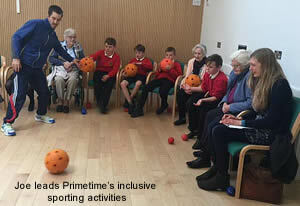 Playing intergenerational sports with Primetime members is both tremendously competitive and warmly co-operative. It helps youngsters and oldsters to understand each other better. During the break the children asked questions and worked closely with the older members of our community. Malcolm showed them how his tremor makes it hard for him to pick things up. They all had a go at picking up pens, pencils and sheets of paper with shaky hands. Richard was challenged: ‘Did God give you cancer because you don't believe in Him?' Good question. 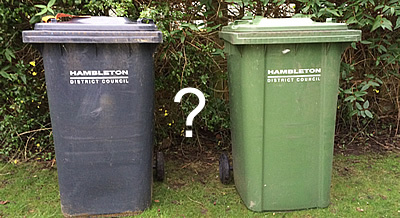 Answers on a postcard, please. Two visitors from the Alzheimers Society's Programme Partnership (Youth) attended the session to witness how Primetime creates opportunities for intergenerational participation in sporting activities. They were very impressed, and have taken photos and gathered information in order to design activities suitable for people living with dementia and their carers. Fifty-one participants enjoyed being involved on this occasion, and the continuing networking with the school is not in doubt. Year 6 children, after two years with Primetime, waved fond farewells to the older members, as this was the final session of their Primary School career. The younger children promised to return in the autumn.